Laura Barker’s short documentary, Dean McComb – Fighter opens with unnerving statistics: Northern Ireland has the highest rate of suicide in the United Kingdom. Suicide statistics and prevention information is always troubling (as it should be), and when those statistics involve teens and young people it feels even more devastating – not only for a young life cut short, but for the friends and family affected by the unexpected loss of a loved one. Barker’s film focuses on 25-year old Dean McComb whose young life has been affected by tragedy. His younger sister was killed in a hit and run accident and his brother and partner took their own lives. With the help of Jim Donnelly (Northern Ireland Director of the charity Active Communities Network), Dean is mentoring teens and young adults via boxing to make a difference in his community and to process the heavy emotions that stemmed from the loss of his best friend and brother. 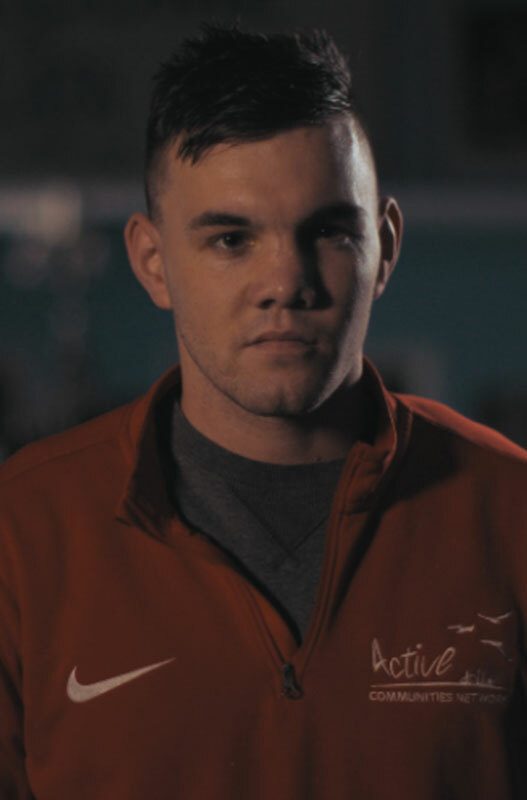 In the film, Jim describes how the boxing club was so affected by Dean’s brother’s suicide. He recalls how he had the members sign a pact that if they were having suicidal thoughts, that they would let someone know, that they wouldn’t keep those feelings to themselves. By focusing on the Active Communities Network and the work that the organization is doing, the film really emphasizes the power of community and how important it is for young people to develop a network of emotional support to help prevent tragedy and to work through it. Regardless of city or town or country, teens and young adults need a place where they feel safe to make connections and talk about their feelings. They need people to help them process heart-breaking events, and this film really highlights how important charities and community centres are for young people, regardless of statistics. It’s also inspiring to see how a seemingly tough and aggressive sport like boxing is being used as an emotional release, especially for young men. There’s a perception and an assumption that that men need to be tough, push down their emotions and not talk about them. And, as the film points out, that can be dangerous. Without a doubt, the work that Jim and Dean are doing is a worthy subject of exploration. The only negative thing that I can say about Barker’s film is that it’s almost too short. It would have been nice to see more interviews from the other teens and kids at the club and hear what boxing means to them, just to get a bigger picture of how this club functions within the community and how other people’s lives has been changed. But, it’s a testament to the effectiveness of this subject matter that leaves me wanting more from Barker’s documentary. Dean’s story is disturbing and moving – it’s shocking to me that one person’s family could see such tragedy in such a short timeframe. But the fact that his story is so common in this part of the world is what really resonates. Documentary films help expose us to other people’s worlds, what it’s like to walk in their shoes and the unseen burdens that so many people carry with them. If the film feels too short, it’s only because the story is so compelling that there’s more to talk about when the credits roll.